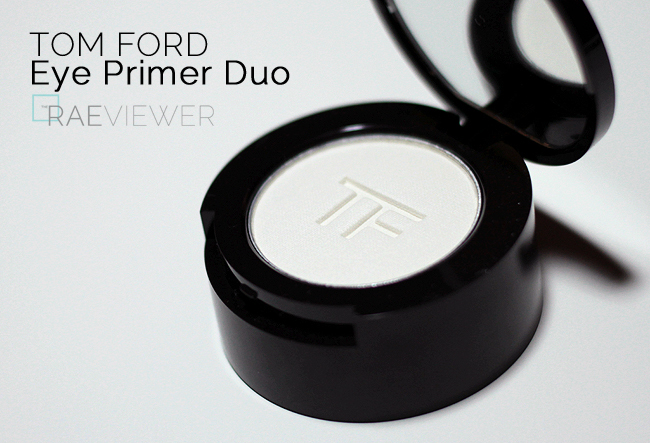 The Tom Ford Eye Primer Duo, $45 USD, is new for Fall 2013. 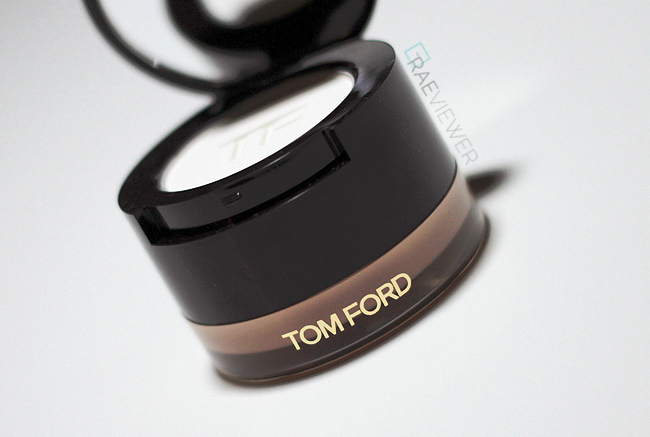 It is a pairing of exceptional powder and cream formulas that is designed to work with Tom Ford's eye colors. The chic stackable packaging with a mirror in the top lid conserves space on any vanity counter or in a cosmetics bag, making this a travel-friendly product. The literature claimed to deliver fifteen-hour hold as well as color-rich staying power, so I was very excited for this release. Check out the swatches after the jump! The directions on the box instruct you to apply the primer on clean lids, dust on the setting powder, and finish with Tom Ford eye shadow. 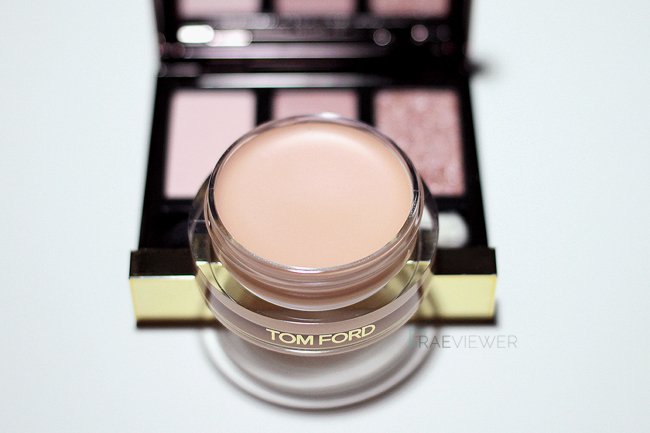 I noticed immediately with the first trial run of the Eye Primer Duo that my Tom Ford Fall eyeshadow trio in She Wolf looked silkier and smoother, with complete color coverage. I had previously worn the trio on my bare, unprimed lids and was already impressed at the pigmentation. Applying the shadows on top of the cream and powder duo, however, took the color to a whole new level. My eyeshadow did not fade at all during wear. NOTE: I do not recommend wearing the cream base alone unless you have dry eyelids that require intense hydration. Now, I normally use By Terry's Eye Primer, which is a pigmented whipped mousse that is applied to the lids with a standard wand applicator. The hyaluronic acid in the formula allows it to glide on and plump up the skin to fade the appearance of fine lines. Tom Ford's eye primer does not contain any hyaluronic acid, but it does feature the exclusive new Infusing Complex which is equally effective at smoothing out the surface of the eyes. The translucent pressed powder in the top deck of the Eye Primer Duo contains kaolin, an oil-absorbing ingredient, and ensures your eye color will stay fresh all day. The By Terry Hyaluronic Eye Primer is $47 USD for 7.5 mL, while the Tom Ford Eye Primer Duo is $45 for 7mL of the cream as well as 2.2 g of the powder. That is a fairly generous amount of product for a designer duo, especially since this primer should last a year depending on usage. 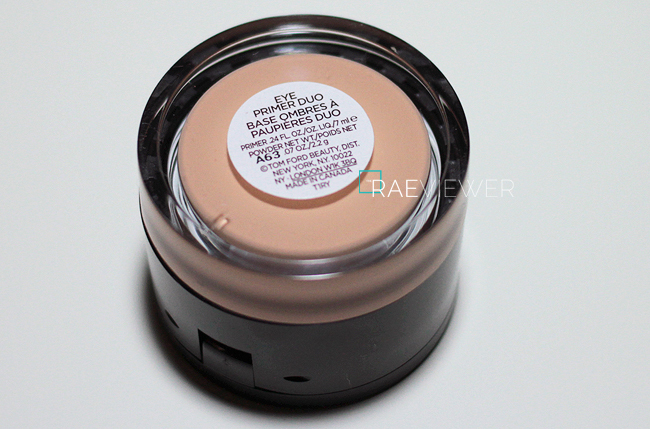 The cream base is essentially colorless because it blends into my light-medium skin, so keep in mind it does not apply as beige as it appears in the packaging. I layered 4 swipes with my ring finger for the swatch, but I use just two swipes across each lid when using eyeshadow. The cream base evens out the surface of my eyelids so well, considering it has a thinner consistency than I am accustomed to. 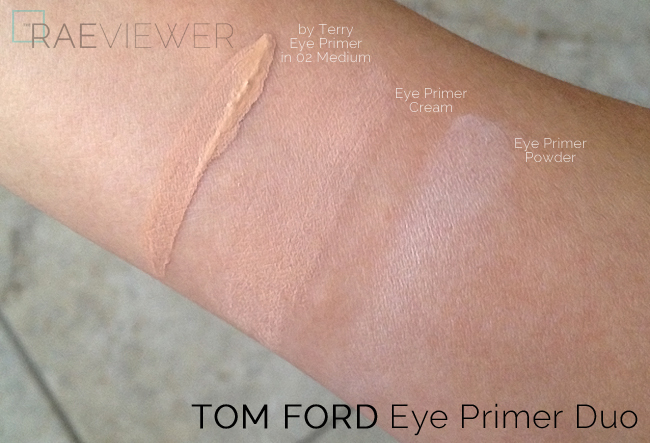 The primer warms up at the touch of my fingertips and blends easily like a fluid créme on the eye. There is no need for tugging or pulling whatsoever. It subtly brightens up my eyes with its pale peach undertones, which will be ideal for those with any darkness on the lids. The translucent pressed powder contains silver shimmer that binds well (no fall out), and the white base is more pigmented than expected. 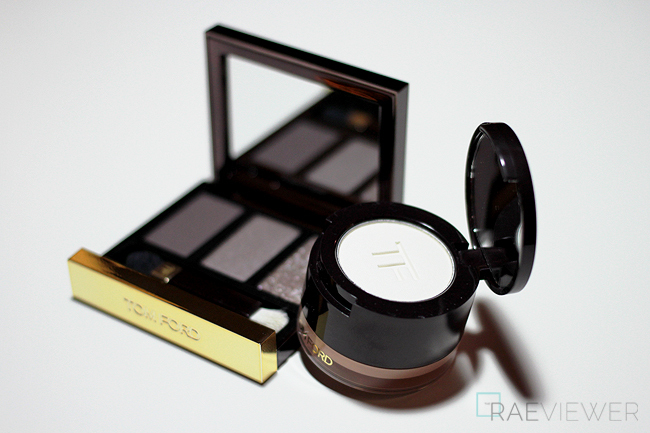 I love how silky the powder feels and use my Tom Ford Eye Shadow Blend brush to apply it. The pricing is a little inconsistent. The official press information cited the Eye Primer Duo at $50 USD, which is what Saks Fifth Ave is selling it for. Bergdorf Goodman and Neiman Marcus are selling it for less, at $45 USD, which is the first time I have seen an inconsistency in pricing. It may be a system error, but you may want to take advantage while you can in the instance the price is changed to $50 at all retailers. 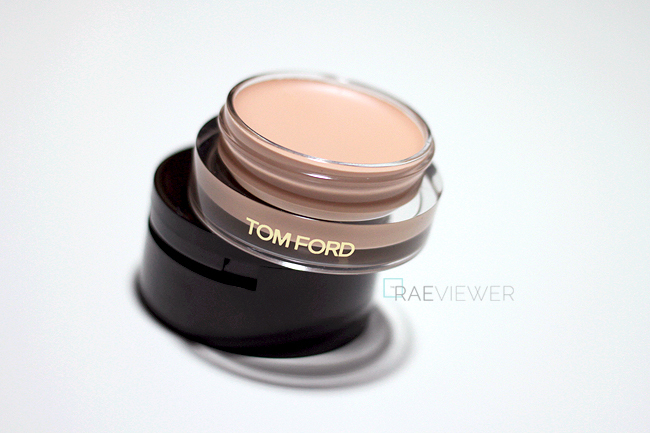 Bottom Line: This two-step eye primer might not be for everyone, but I am very particular with eyeshadow primer and love that Tom Ford's new Eye Primer Duo is as effective as it is unique! Wow, how cool! I definitely covet this now... Does the white powder brighten eyeshadow in a similar way to the NYX Jumbo Eyeshadow Pencil in Milk? Can we see comparison swatches of eyeshadow layered over this primer vs. no primer or different primers? Okay, my interest is piqued. I always cream-then-powder prime for my stubborn lids, but I don't think I've ever seen a brand put out a primer that recommends the same. This looks very, very cool -- thank you for bringing it to my attention, Rae! I wasn't even thinking about this but when I went to the counter I got talked into getting it... It felt sooo smooth :) great review! What else did you pick up besides she wolf? Sounds interesting with the cream to powder, though there are others like it out there & for last but does it last the full 15 hours?